Haitian state, collapsed in 1986 when the normally passive peasantry and urban poor were roused by the message of social justice spread by the grassroots Catholic Church or ti-legliz. The ideal of democratic reform was placed for the first time within reach of the previously dispossessed masses but an economic model that linked democracy with free-trade was also ushered in. Consequently, the central paradox of today's Haiti derives from an explosive clash of a market-dominant elite and a newly empowered underclass. Despite the sweeping title of Peter Hallward's Damming the Flood: Haiti, Aristide and the Politics of Containment, he focuses narrowly on the second term of Aristide's Presidency from 2000 to 2004. 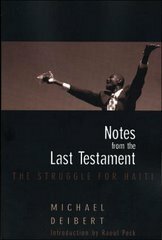 Hallward admits that, having visited Haiti only twice, the book is not the product of 'a long familiarity' with its history and culture. This is a refreshing admission as, far too often, Haiti is seen as being so odd as to be understood only by the so-called insiders or Haitians themselves. However, Hallward's narrative is not that of a disinterested outsider but reads like that of an over involved insider down to the use of Creole proverbs as epigraphs. His intention may have been to defend President Aristide against demonization but not only does his account depend heavily on the remarks of excitable party activists like Patrick Elie but he dismisses anyone who opposes Aristide as resentful, embittered schemers and instinctively distrusts the sober negative assessments of Aristide by knowledgeable scholars such as Charles Arthur and Robert Fatton. balanced book would have examined Aristide's involvement in the anti-Duvalier struggle, his lack of political skills when in power and his reliance on the principle of the big man or gwo neg in governing Haiti. While admitting that the popular movement is no longer 'dependent on a single charismatic leader', Hallward is blindly admiring of Aristide. The interview with Aristide that ends the book serves only to reinforce this bias. Hallward's heart is in the right place but Haiti is not just another arena for the struggle between the evil guardians of international capital and a heroic local freedom fighter. One only has to read Edwidge Danticat's memoir Brother I'm dying (2007), which gives us an insider's view of Belair, which Hallward sees as a Lavalas stronghold, to see that that political chaos in Haiti creates only losers.